Today's an exciting day in our giveaway. 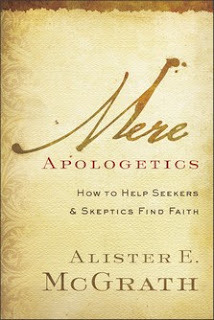 Baker Books, today's sponsor, is actually giving our readers the chance to win Mere Apologetics by Alister McGrath before you can buy it! Throughout history there have been great and articulate defenders of the faith. But with the new challenges of scientific atheism we see in our day, there is a need for a fresh and flexible approach to apologetics. Rather than supplying the fine detail of every apologetic issue in order to win arguments, Mere Apologetics teaches a method that appeals not only to the mind but also to the heart and the imagination. After discussing the biblical basis for and historical uses of apologetics, McGrath offers various approaches to sharing your faith with others. He outlines pointers to faith, such as our innate sense of longing for justice, our appreciation for beauty, the order we see in the physical world, and much more. He also shows how there are many right ways to share your faith--through explanations, arguments, stories, and images--and helps you decide which works best for your personality and your audience. 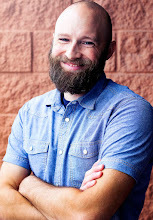 "Apologetics is not to be seen as a defensive and hostile reaction against the world," says McGrath, "but as a welcome opportunity to exhibit, celebrate, and display the treasure chest of the Christian faith." If you long to commend your faith to those outside the church, Mere Apologetics will show you how to do so gracefully and effectively. 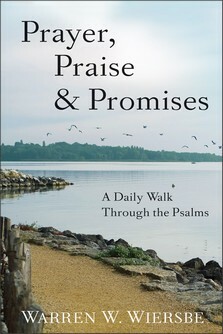 Additionally, our winner will get Prayer, Praise & Promises by Warren W. Wiersbe. The Psalms have always held a special place in worship. From expressions of joy and thanksgiving to heart-wrenching pleas for mercy and strength, these poetic verses have been the basis of Christian worship for millennia. You can experience the riches of the Psalms every day with Prayer, Praise & Promises. In this classic book, Warren W. Wiersbe plumbs the depths of the Psalms and adds personal devotions and reflections you will want to savor all year long. If, like the saints of old, you yearn to make the Psalms a part of your daily expression of love and gratitude to God, this book is the place to start. For a complete list of prizes and rules, click here. You can enter using the PunchTab app below. RSS readers will need to click through to see the widget. Good luck! Turkey dressing, as long as it doesn't have raisins or oysters in it, though eggnog and hot chocolate are pretty wonderful as well! Apple cider! Great warm drink for the cold weather!